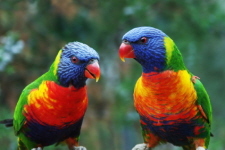 The Rainbow Lorikeet is a member of the Parrot family and one of our Australian birds that is also found in other parts of Australasia including Papua New Guinea. They measure about 30 centimetres in length, they really are like a rainbow with their blue head and belly, green wings, tail and back, and an orange and yellow breast. They generally travel in pairs and feed in smaller groups of 20 or so, but at dusk they rest in groups of hundreds in the trees, when in large flocks they make a lot of noise when they fly between trees and when they are feeding. 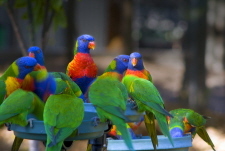 Lorikeets can be aggressive and are considered pests in some places because of the damage they can do to fruit trees. They eat mainly pollen and nectar, but they will also eat fruits, seeds and some insects. Breeding time is usually in the spring, September to December in Australia. The female normally lays two eggs which she sits on for about 25 days, both parents then look after the young.